The Pacific Template is one of the best responsive websites in 2014 because it seamlessly integrates impressive imagery with text. The hero image on the top of the template provides an opportunity to showcase merchandise, food, artwork, or other important photographs. Yet, there is still plenty of room to include a tagline or other text over the image. A user-friendly horizontal menu atop the template serves as an in-page jump to sections lower on the page. It’s easy to see how the Pacific Template translates beautifully to mobile devices and tablets, with easy scrolling from one section to the next. The WIX Web Design Template makes a statement with its simplicity and strong lines. Ideal for graphic designers, painters, performing artists, photographers, and any creative spirit, this template is all about showcasing images. The faded hero image offers a space to proudly highlight a vibrant graphic, while the overlaid text is ideal for introducing yourself as an artist or other professional. A simple scroll down the page reveals more images of portfolio pieces or past projects. In short, its quiet elegance is why this template was chosen as one of the best responsive templates of 2014. This template is designed around a wilderness theme by default, but it can easily be transformed into a clean website displaying products, artwork, and other imagery. The crisp white background provides the perfect backdrop for large photo thumbnails, all clickable and leading to more image galleries. The galleries section uniquely divides up categories of a portfolio or photo collection in a large patchwork of sorts. Users can easily navigate between albums, and the responsive website is easy to navigate across devices. Despite having such a simple design, this template has earned a spot in our responsive design awards because of its modern appeal and ease of use. 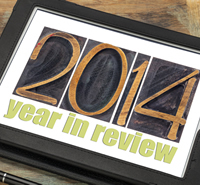 2014 brought an abundance of creative web design and templates. With so many templates to choose from, it’s easy to pick one for your blog or small business that reflects your personality or the brand of your business. The top templates of 2014 will all adapt to any device, so you can present a fresh outlook while giving your visitors a consistent experience each time they visit your site from any phone or computer. Curious about responsive templates? Check out these tips for working with mobile site builders.